68 Days until Halloween. 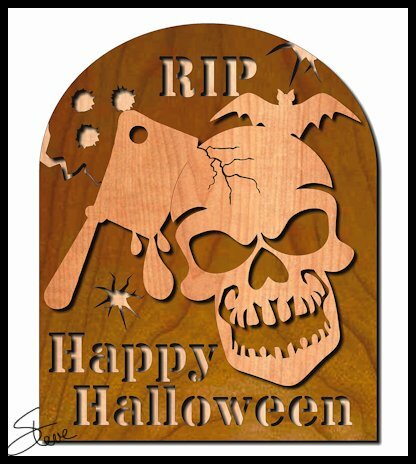 Tombstone Halloween Pattern. It is officially too early for a Halloween pattern. Right? I get fussed at all the time for waiting until the last minute to do a themed pattern. I thought I would throw in a few themed patterns early this year. I started the Personalized Christmas Ornament patterns early so this Halloween pattern should be okay. This pattern is kind of gruesome, It is inappropriate for young children and old men. 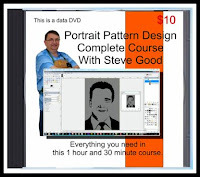 Any man over 62 needs to ask permission from his wife to download this pattern. Bladder control problems have been known to happen in men over 62 from long term exposure to this pattern. Of course bladder control problems have been known to happen in men over 62 even if they don't look at this pattern. 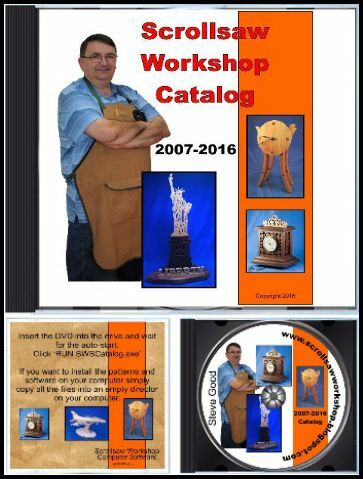 A couple posts ago I shared some YouTube videos by Scott showing his craft show preparation. I mentioned that I would like to see even more from Scott. He got in touch with me and said he has a large show this weekend in Cary, NC. (Lazy Daze). We are in luck because Scott is going to try and take some video of his setup. I know he will be swamped but I hope he gets a few shots. 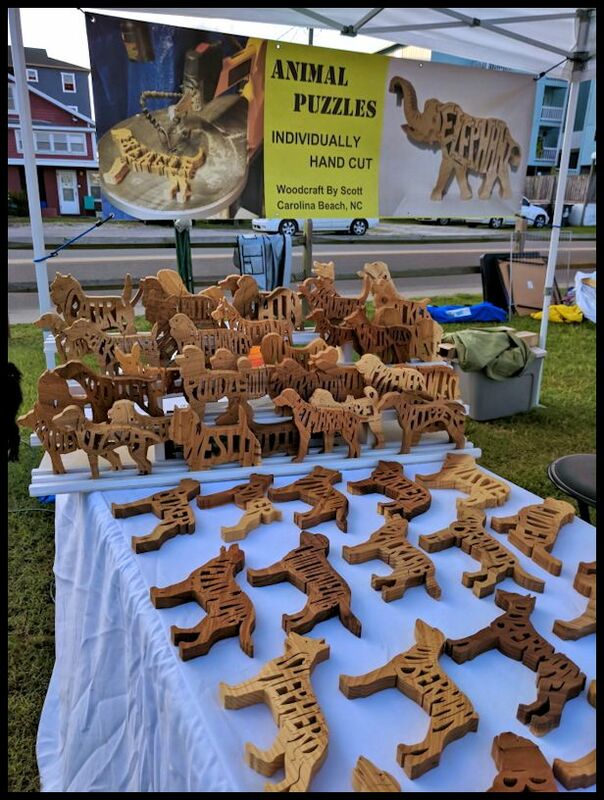 He shared a few images with me of his booth that he sets up at a local Farmers Market. In my opinion this is close to a perfect setup. It's not a large or fancy booth but he gets the details right. Here are what I think are the highlights. The tent and tables are white and clean. They are nice looking without being distracting. There is enough room for his customers to walk around to three sides and get a good look at what he has. The signage is large and clear. Good pictures of his work and simple, easy to read fonts. You also know instantly what he is selling. 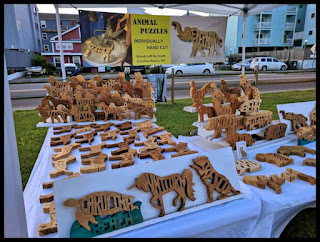 Key wording on the main sign(Individually Hand Cut) lets' you know these are not mass produced puzzles. They are one of a kind heirloom pieces. He respects his art and it shows. Speaking of his art. He specializes in puzzles. There is no confusion at the booth. So many scrollers will take several different types of projects to a show. This is almost a sure way to kill your sales. Too many different style of project makes the booth look disorganized and confusing. Specializing as much as possible is the way to go. You don't necessarily have to make just one project type but no more that three or four at most. Scott has displayed his art carefully and nicely organized. Notice that the dog puzzles are clustered on the left and on a riser. He has things displayed in themes. Some are on risers and some are laying flat to nice effect. The variation of layout is pleasing. 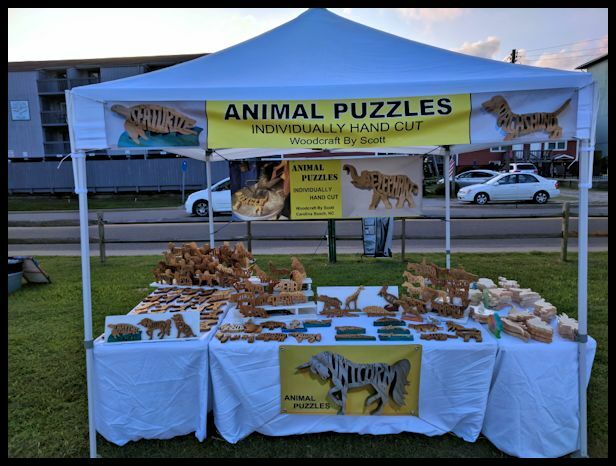 I am guessing here but I suspect he has more inventory under the booth with pieces shrink wrapped with his business card included. That way he can keep his booth well organized and looking fresh throughout the day. 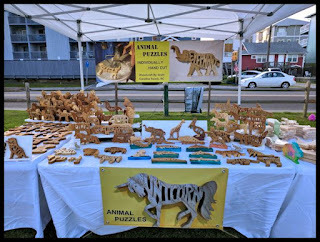 If you do sell a piece off the table try to replace it with another item to keep the booth full. 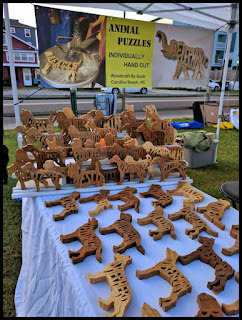 Notice that the rear sign shows a puzzles being cut with his scroll saw. This shows the artist at work and demonstrates that this is art and not factory made. 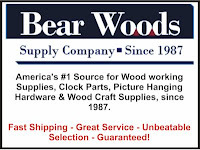 It can be even better if you can have your saw there but the sign is a great second choice. Always keep a few blades in your pocket to show the customer how tiny they are. 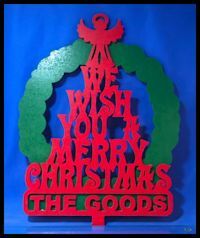 Many people have never seen a scroll saw and they love knowing that the art took skill to make. They usually don't want to hear details. Just give them the "It's hand made with this tiny blade.) line and that's enough to get the point across but not put them to sleep. I think Scott has a nearly perfect setup. 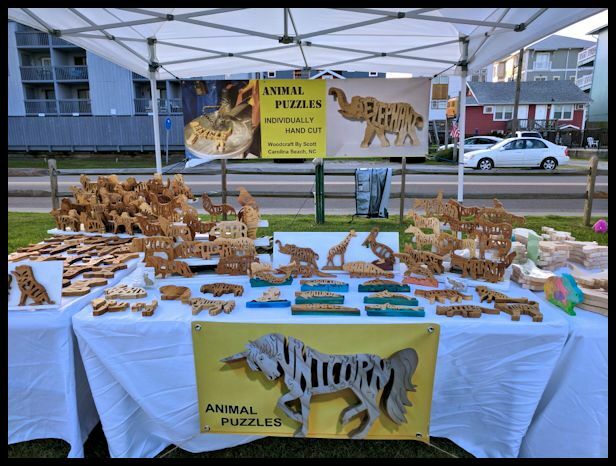 Nothing guarantees that you will have a successful show every time you set up but Scott has greatly improved his odds with this booth. Of course it is critical that you also make your customers comfortable with you personally. From watching Scott's YouTube videos I suspect he has that part down pretty well also. If this were a publicly traded company and I were a stock analyst for the Wall Street Journal, I would rate this a strong buy. As you can tell I am impressed. Great job Scott. I really look forward to your future videos. Keep us posted. 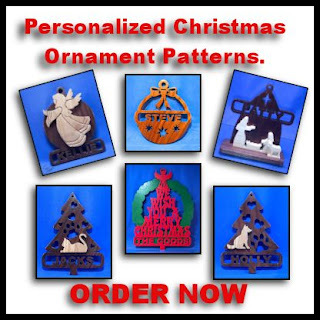 Click to order you Personalized Christmas Ornament Patterns. 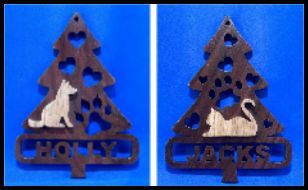 As of 1:31am 8/24/2017 I am caught up on Personalized Christmas Ornament Pattern orders. Thanks for your patience as I recovered from my trip last week. It took me a couple days to get back in the swing but I should be back on schedule now. Orders should take no more than three days to complete if you order now. Just a reminder that the three primary ornaments can be ordered with or without the year. The pet ornaments and the door wreath do not have a year option. $1 per name with a 5 name minimum order. 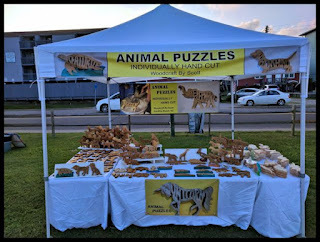 $2 per dog or cat name. No minimum order. The three primary ornaments can have the year included as show above. No additional charge. 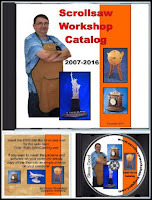 The patterns will be delivered to your email address. You only pay if you are 100% pleased with the patterns. I will include a link to pay with your credit card in the email. I will also include my address if you wish to send check or cash. 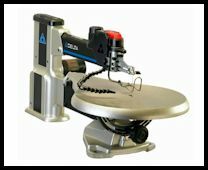 This is a nice mid level saw with high end features. Without the stand and light it's listed under $400. If you want to move up from an entry level machine and not break the bank this Delta will get the job done.